The things we do for internet! In the Caribbean we would move anchorages and make sure there is WiFi before we would stay a bit, but here, WiFi being VERY rare if not non-existent, it works differently… On Fridays, the post office in the village of Apataki is only open from 7:30 to 9:30 am. And, the post office is the only place where one can buy phone cards (“Vini cards”), which Mark and I use to get on the slow and unreliable 2G network. 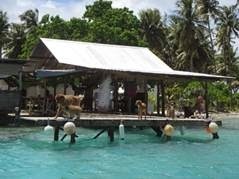 Even though it works poorer than in the remote Kuna Indians territory of the San Blas islands (believe it or not! ), it is our only option of staying connected out here. We pay about $5 for 100Mb and depending on our location and the quality of the signal, this will last us two weeks or 2 days! On this particular Friday with light winds, we left the boatyard area at 6am to slowly sail directly downwind to the village. We had to go east (to leave the lagoon) to go west. Within half a mile of the dock, before reaching the pass, we dropped the dinghy in relatively choppy waters and I quickly jumped in and drove to town to buy a few phone cards and highly needed supplies. Only, the store was closed, a frequent occurrence, so – for the first time ever – we relied mostly on cans for food the following week. Once the dinghy was strapped back on and the boat ready for another sail, we crossed the SW pass at slack tide and entered the ocean, while locals were wishing us “bon voyage”. Based on weather reports it was supposed to be a comfortable, easy, 3 hour sail, in 10-15 knots of NE winds - upwind in one tack - to reach Anse Amyot in Toau. Sails up and engines off, we pointed Irie’s bow to our destination, only to find out that this was definitely not going to work! The wind came from the SE, the exact direction of where we needed to go. 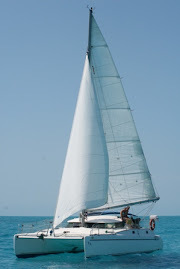 What followed was a seven hour sail tacking back and forth (all the way to the back or ocean side of the boatyard! ), covering another 50 miles, instead of the required 17. The weather was lovely, the wind speed perfect and the sea conditions comfortable, but, at the end, we still needed to motor for an hour to make the mooring field before dark. Anse Amyot has a very easy approach, with no pass or currents to worry about. You have the option of picking up one of the dozen or so mooring balls for about $7 a night (or acceptable and favored goods by the owners of the balls) or for free if you eat a meal ashore when their restaurant is open, or of anchoring between the coral heads. 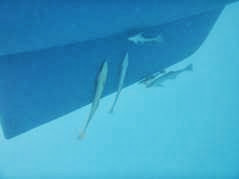 Since we have decided to go for “easy” wherever possible in the Tuamotus, we grabbed a mooring ball, which, because the wind died the next two days, took off some of our fresh paint immediately and kept going bang bang bang against the pristine blue hull. Still better than being surrounded and splattered by an oil slick like the previous two times after we put antifouling on, though! The flies were horrendous until the wind picked up again. 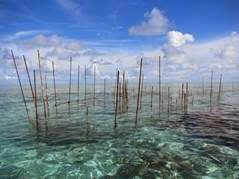 During the calm days, the sea was flat and of the clearest blue. The water of the lagoon so azure that the underside of the wings of white birds appeared to be blue from the reflection! 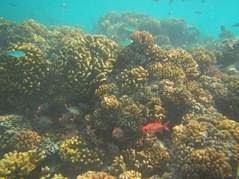 Snorkeling was amazing, with healthy corals – whole “forests” of it - and a multitude of colorful fish; the occasional reef shark sneaking by, big groupers strolling about and sucking remoras favoring Irie’s bottom. When the weather turned nasty again, the place was well protected and comfortable enough to sleep at night. The fresh breeze filled our boat batteries; the rain our fresh water tank. Over the weekend, the owners of the mooring field (Valentine and Gaston) and their neighbors (four people in total living on this motu) left to go vote in Fakarava, one of the biggest atolls in the Tuamotus. 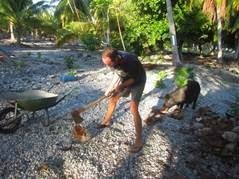 Mark and I cooked meals for the dogs and split coconuts with an axe to feed the pigs. 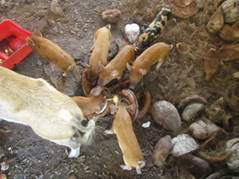 We made sure all the animals had enough to eat and, on the hottest day, took an extra trip ashore to “shower” the panting pigs and piglets with rainwater from the barrel. 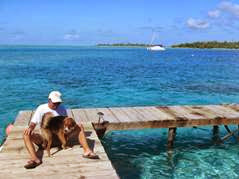 It felt great to take care of the property and the animals and it made us long for a simple life ashore. Once the weather clears up and the wind has a northern twitch to it (in the forecasts anyway), we will try to reach Fakarava, about 45 miles from here and hopefully no more than a day sail away. There, based on written and personal reports, a few stores, “decent” internet and world class snorkeling await us. 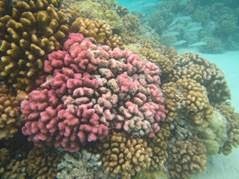 It is one of the highlights in the Tuamotus and we hope to spend a decent amount of time there. Fish abound in the Pacific! 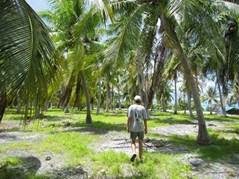 Going for a walk with the dogs in the palm rich interior, on the sharp coral ground – we haven’t seen any sand in the Tuamotus yet! 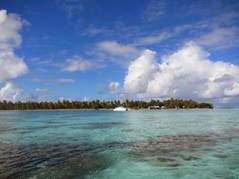 Your pictures are incredibly beautiful and make me very excited to come back down to French Polynesia. 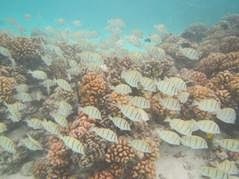 Can't wait to see your snaps of snorkeling in Fakarava!